Liczba stron: 121 Jest to ujednolicona liczba stron, która ułatwi Ci porównanie długości książek. Każda strona Legimi to 200 słów. 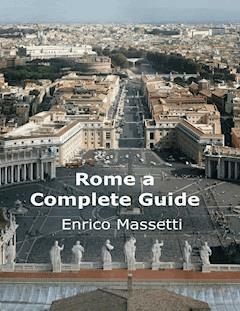 This guide covers the details of a four-days visit to the major attractions of Rome, Italy. It also covers several other itineraries to discover other parts of the eternal city less known and frequented by tourists.There are extensive descriptions and color photos of the attractions for you to use during your visit.The guide is ideal for use on your smart phone or your tablet, it contain active links to the web sites of train and air travel companies, so you can with a click from the guide check the latest schedule and even buy the tickets. It has also listing of many reviews for the best recommended restaurants that are at walking distance from the location where lunch or dinner are planned.There are active links to the review pages, you can use them if you have an active Internet connection, but, if you don’t, you have the basic information ready: the name, address and telephone number are included in the guide. This guide leads you through a four days visit to the most famous attractions in Rome, and then has several other itineraries that describe the lesser known aspects of the eternal city. Having exactly 4 days, you must be willing to work hard to experience as much of Rome as possible. • through the official seller before leaving home:http://www.coopculture.it/en/colosseo-e-shop.cfm. • at the forum or palatine hill entrance. • All three of the above options will allow you to bypass the lines into the Coliseum. You should alsomake hotel reservations in advance. If you plan to take the bus from Fiumicino Airport to the Termini Station, make advance reservations to guarantee a seat. Rome in 4 days – Day 1. G - Piazza di Spagna. Suggestion: The late afternoon could be the right time to go on a panoramic drive on the double-decker buses of the Atac 110 line that makes several stops in the center. The Coliseum owes its name to a colossal bronze statue, representing the Emperor Nero, more than 35 m. tall, that used to stand in this area. A symbol of Rome worldwide, the Coliseum was built by the emperors of the Flavian dynasty between 72-80 A.D., on the site once occupied by an artificial lake belonging to the magnificent Domus Aurea, a compound of buildings and gardens built by Nero now in ruins but with beautiful decorations which inspired Renaissance painters. As much as 100,000 cubic meters of travertine from the Tivoli quarries were used to build this amphitheater, the largest ever built during the Roman Empire. The Coliseum could hold more than 70,000 spectators who could watch the fights between gladiators, the hunting of animals and, at the very beginning, the naumachias: naval battles that took place in the arena that was flooded. The architect who designed the Coliseum is said to have been thrown alive to the wild beasts “as a reward for his own work”, thus inaugurating the long story of blood and cruelties of the building he himself had conceived. In the Middle Ages the Coliseum was transformed into a fortress. Later on, stripped of its structures, it became in turn a quarry for building materials and finally the seat of hospitals, fraternities and craft guilds. It was only towards the middle of the 18th century, that Pope Benedict XIV had it decreed a “sacred site”, and the plunder and devastation was stopped. The Coliseum today is now a major tourist attraction in Rome with thousands of tourists each year paying to view the interior arena, though entrance for citizens of the European Union (EU) is partially subsidized, and the entrance is free for EU citizens under eighteen or over sixty-five years of age. There is now a museum dedicated to Eros located in the upper floor of the outer wall of the building. Part of the arena floor has been re-floored. Beneath the Coliseum, a network of subterranean passageways once used to transport wild animals and gladiators to the arena opened to the public in summer 2010. Suggestion: in order to avoid the long lines, it is possible to purchase tickets at the entrance to Palatine in Via di San Gregorio and by the Arch of Titus. The Roman Forum, the most important archaeological area in Rome, extends from the Capitol Hill to the Palatine. As far back as the 7th century B.C., the Forum was the centre of political,commercial and religious life: the site of triumphal processions and elections; the venue for public speeches, criminal trials, and gladiatorial matches; and the nucleus of commercial affairs. Here statues and monuments commemorated the city's great men. The teeming heart of ancient Rome, it has been called the most celebrated meeting place in the world, and in all history. Located in the small valley between the Palatine and Capitoline Hills, the Forum today is a sprawling ruin of architectural fragments and intermittent archaeological excavations attracting 4.5 million sightseers yearly. Later on, to the original Roman Forum were added the Imperial Forums: Foro di Cesare, Foro di Augusto, Foro di Nerva, Foro di Vespasiano and the most imposing one, the Foro di Traiano, of which one can still admire the huge Column of the Markets. Eventually much economic and judicial business would transfer away from the Forum Romanum to the larger and more extravagant structures (Trajan's Forum and the Basilica Ulpia) to the north. The reign of Constantine the Great, during which the Empire was divided into its Eastern and Western halves, saw the construction of the last major expansion of the Forum complex—the Basilica of Maxentius (312 AD). This returned the political centreto the Forum until the fall of the Western Roman Empire almost two centuries later. Since its origins the Capitol Hill has been the seat of the city’s government and the adequate place for solemn public celebrations. Piazza del Campidoglio, designed by Michelangelo, is surrounded by three noble palaces: the central one, Palazzo Senatorio, is the seat of the Municipality whereas the two on the sides, Palazzo dei Conservatori and Palazzo Nuovo, host the treasures of the Capitoline Museums. The Capitoline Picture Gallery contains over 200 paintings from the 14th to the 18th centuries by extraordinary painters such as: Tiziano, Pietro Da Cortona, Caravaggio, Guercino, Rubens and many more. The square is dominated by a copy of the bronze equestrian statue of Marc Aurelius that survived destruction because it was believed to represent the Christian emperor Constantine. The elegant plinth was designed by Michelangelo. The original can be admired inside the adjacent Museum. The Pantheon is an impressive example of the exquisite architectural technique of ancient Rome. It consists of a huge cylindrical body of equal height and width, covered by a great hemispherical dome. Important artists such as the painter Raphael are buried there, as well as the Italian Sovereigns of the period when Italy was a monarchy. Opposite to the Pantheon is Piazza della Rotonda with its beautiful fountain designed by Giacomo Della Porta. Built as a temple dedicated to all the gods, erected by Marcus Agrippa in 25 B.C. and later rebuilt by Hadrian around 120 A.D., the Pantheon underwent several transformations: a Christian church in 609 and a fortress in Medieval Times. From an eagle eye’s view, the arena-like shape of Piazza Navona can be easily noticed. As a matter of fact, the piazza was built on the Stadium of Domitian, whose ruins can still be admired in the adjacent church of Sant’Agnese in Agone. The church, designed by the great architect Francesco Borromini, is an excellent example of the Roman Baroque architecture. In Piazza Navona are three fountains: Fontana del Moro, Fontana di Nettuno and in the centre of the square Bernini’s magnificent Fontana dei Fiumi. Four allegorical statues portray the Nile, the Ganges, the Danube and the Rio de la Plata, symbolizing the four corners of the world. Traditionally, from the beginning of December till the Epiphany, this piazza is occupied by stalls selling sweets and toys. Around 86 A.D., Emperor Domitian had a stadium built on a pre-existing amphitheater of Nero’s time and over the centuries the square became a place for games, tournaments and processions. From the 17th to the 19th centuries the square used to be flooded to allow the ships of princes and prelates to parade in a background of fireworks. The spectacular effect of the Trevi Fountain is not revealed gradually; none of the streets leading to it is in axis with the fountain itself. It is rather the sound of the water that suggests its proximity, but we reach it all of a sudden, and it is as if a curtain was lifted in front of our eyes in a surprise effect that never fails. Designed in the 18th century by architect Nicola Salvi and built over thirty years, the Trevi Fountain is the celebration of water as a symbol of life, health and change. Its location indicates the end of the course of the ancient aqueduct of the Acqua Vergine (19 BC), the history of which is related on the reliefs in the upper section of the facade. The charm of the fountain is enhanced by the contrast between its large size and the small square that contains it and seems to almost compress it, along with its location on the side of a building that does not allow the viewer to walk around it as it normally occurs. The personification of Ocean at the centre of the structure appears to emerge from the water on a chariot led by sea horses and tritons, amidst rocks that are decorated with the representation of thirty varieties of plants. The overall effect is a unique combination of sculpture, architecture and nature in which we can imagine the building blending with the rocks and the gushing water. Don’t forget to throw the famous coin to ensure your return to the Eternal City…To respect the “proper procedure” one must stand with one’s back to the fountain and throw the coin with the right hand over the left shoulder. A meeting place for both Romans and tourists, Piazza di Spagna is famous for its theatrical staircase, a creation of Francesco De Sanctis, and for its fountain known as La Barcaccia, designed in 1629 by Pietro Bernini and his son Gian Lorenzo in the shape of a boat semi-submerged in water. At the right corner of the Spanish Steps there is the house of the English poet John Keats, who lived there until his death in 1821: nowadays it has been changed into a museum dedicated to him and his friend Percy Bysshe Shelley, full of books and memorabilia of English Romanticism. At the left corner there is the Babington's tea room, founded in 1893. At the top of the Spanish Steps is the Church of Trinità dei Monti, erected by order of the king of France Louis XII in 1502. Farther along, on the left, is Villa Medici, today the seat of the Academy of France. The streets that host the most important fashion shops, but also the sites that have left a mark on the history and the culture of Rome depart in rays from Piazza di Spagna. In this respect a visit to Caffè Greco in Via Condotti is not to be missed. Originally Piazza di Spagna was named after the imposing church at the top of the great flight of steps, Trinità dei Monti, one of the French churches of Rome. Only in the 17th century, when Palazzo Monaldeschi became the seat of the Spanish Embassy, did the square become known as Piazza di Spagna in order to win the rivalry with France, owner of Trinità dei Monti. The late afternoon could be the right time to go on a panoramic drive on the double-decker buses of the Atac 110 line that makes several stops in the centre. This is certainly a pleasant way of becoming aware of the essence of the “eternity” of Rome: the historical continuity between the past and the present in an urban space in which monuments and buildings built in different periods coexist side by side. • La Taverna dei Fori Imperiali via Madonna dei Monti, 9, 00184 Rome, Italy +39 06 6798643: Great local restaurant, slightly off the beaten track not far from the Colosseum. It's very popular, so definitely worth booking in advance. • Divin Ostilia Wine Bar Via Ostilia 4, +39 06 704 96 526: Brilliant little wine bar one street back from the Colosseum. Walk past the tawdry tourist restaurants serving dreadful food, turn to right into Via Ostillia and there it is. Serves amazing pasta dishes - lasagne with sardines, pine nuts and raisins, cannelloni stuffed with fresh salmon, wonderful roast porchetta, divine vegetarian platters, excellent wine by the glass and bottle. • Hostaria al Gladiatore Piazza del Colosseo, 5, +39 06 8880 5383: Overall this place is excellent. Great location at a few minute walk from the Colosseum metro station. The food is great and at a reasonable cost. A meal for 2 with a starter to share and main each (bearing in mind one of these was a fillet steak), with a pre dinner cocktail and bottle of wine comes to just over 80 euro. • Crab Via Capo d'Africa, 2, +39 06 7720 3636: One of the best fish restaurants downtown Roma, from the street side you wouldn't expect it. But believe me, it's known by the locals and the food is really outstanding. • Taverna Romana Via Madonna Dei Monti 79 +39 06 474 5325: Off the beaten track, but a great authentic find. Book a table or get there early, as it gets very full quickly. Worth a visit.